A PhD Thesis About OLPC Asks: What are we doing? What are we bringing? My name is Lars Bo Andersen and I have spent the last five years studying OLPC and, in particular, one small project at a school in Nigeria (which I call Akila's school after one of the students). 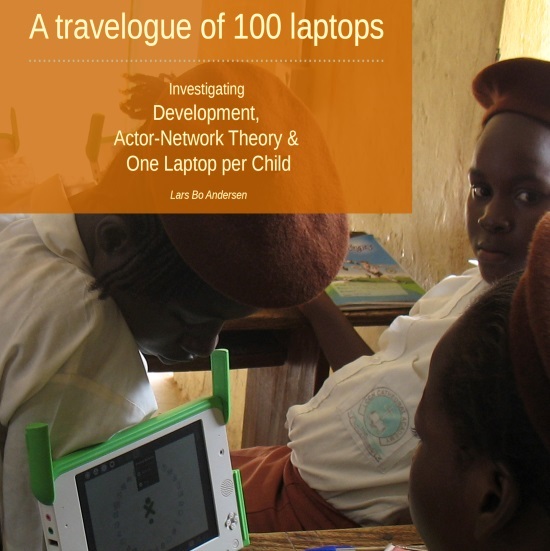 There is, amongst others, a chapter describing the theories and debates around OLPC, there is one investigating how the initiative rose to fame and there are several more specific investigations of the laptops at Akila's school (e.g. chapters 5 and 6). In this post I would like to share some general thoughts with the OLPC News community and, if possible, have them debated in the comments. Let me give away my position from the start: I was/am highly enthusiastic about the opportunities of new technology for learning (I have benefited from these my whole life). But studying OLPC and the project at Akila's school has convinced me that we need to fundamentally re-conceptualise what it is we do when bringing laptops, tablets, internet, etc. into impoverished settings. What OLPC projects do, I argue, is not to bring in laptops, but to reconfigure already existing networks of relations between children, teachers, hardware, software, pedagogy, parents, poverty and so forth. But my argument is not only that we should re-conceptualise what we do, but also what we bring. What is it, really, that we are working so hard to deploy/implement/sustain? I argue that XO laptops (or tablets) too are networks of relations. Not objects, not tools, but networks of relations. The various XOs are, in the strongest (ontological) meaning of the word, sitting on each their respective network within which several actors are busy deploying each their own variant of the XO. I have described these many criss-cross deployments as a development encounter. At Akila's school, for instance, the different deployments running through the network make the XOs suffer from a multiple laptop disorder. The laptops have several different identities and logics, some of which are even mutually exclusive and in friction. The point is that not only is Akila's laptop different from itself, it is also different from Negroponte's laptop, or the ones in Peru and Uruguay. What laptops are and what they can do is the outcome of dispersed negotiation (in the network). In fact, we readers of OLPC News are part of this negotiation. When I claim that laptops are networks, some of you may write (or, at least, think to yourself): "nonsense, that is not what they are; they are tools with which to learn; they are X, no, wait, they are X and Y, but, in either case, they are not networks". This is not just your opinion, or mine, this is in very specific ways something we are working to realise in praxis. In this outlook, the rational, modern world of stable identities (XO as formally described) causing well known effects (trojan horses, mega change, literacy, empowerment, digital inclusion, learning French in Paris...) has turned trickster. The purpose, impact and logic of laptops are evasive and emergent - not beyond control and not within control. Even Negroponte, when claiming that laptops (or tablets) are for helicopter deployments, must accept that it is not really for him to decide - he is not alone in the network. Or, that is, he may make helicopter deployments in Ethiopia, but not at Akila's school, in Uruguay and elsewhere. The world is acting back at Negroponte just like the Nigerian teachers are acting back at the Sugar philosophy. We (as in all of us working with OLPC projects around the world) invest ourselves in the network, we add to the laptop, and so too does children, parents, NGOs, Quanta, solar panels, satellites and everyone else. Quanta adds assembly lines, some of you write activities, and I add a story about Akila to supplement Negropontes stories from Cambodia, Ethiopia and elsewhere. By the way: how can satellites add to laptops? Well, the satellite-isp-company-network adds a rather substantial invoice to Akila's laptop each month in order for the laptop to bridge the digital divide. So, what does this mean? That everything is relative and unpredictable? No, but it is a call to attention that 'XO' is simply the name we give large heterogeneous ensembles (Sugar+Quanta+AMD+Plastic+Scratch+Akila+Teacher+Papert+Batteries....) in which the specific components differ from deployment to deployment. I have tried to re-think (by way of many others) what it is that we do and what it is that we bring. A good question to the community, besides from general comments, is, then, what do you think we do and what, really, are we bringing? Hey steve, this is a valuable suggestion, that those who ends up experimenting with laptops (etc.) know the best what it is we do and bring. I appreciate it for many reasons, but does it not also leave us with the problem, that then we are not allowed to "take control" and make sure that the laptops ends up being what we wanted them to be? What if children / users use the laptops for ends we do not like? As a volunteer in Uganda, I suffer from the results of the disparate versions of XO deployments. I have spent my career in educational technology, but the fact is that I work in the US, am spoiled by the availability of electricity, internet, colleagues, etc. When I go to Uganda, having started purely by accident, I am alone, as I have not found people nearby with the same interests. So I go to Uganda once a year, and cram presentations, XOs and an agenda into my suitcase and for a couple of months prior to my 2 week visit, I frantically search the boards to find an easy way to help the primary students in Uganda. In my absence from Uganda, things fall apart, money gets stolen, electricity is not paid for while I am paying for internet service, teachers do not communicate for lack of internet access and money. I work full time, have a large family and while I am NOT complaining, the fact that I cannot just take a turn-key laptop solution causes me undue stress. I understand completely the dilemma of all these various versions of XOs and software that can/is loaded. The fact that I have to buy small quantities on ebay and each has its own quirks causes me to waste precious time. Expecting those in these third world countries to then "take the ball and run with it" gives me pause as well. I want to do this, but my full-time job, other obligations and the fund-raising to buy more XOs consumes all my time. I need ONE laptop format and periodic updates. Period. What I bring is CARE if you will. I bring the love that an American feels for children born into an environment that is quickly becoming further and further behind the progress enjoyed by the more affluent societies. I bring a possible way out for girls who are exploited into having too many children and too little access to education or careers. I fear I am failing but I continue because it is right. Wow, what a telling story, thank you for that... Also from working with IT in Denmark I know the feeling that things continuously fall apart and require huge amounts of "hidden" work..
You Actor-Network Theory approach on OLPC deployments is basically what African folk wisdom (popularized by the Clinton's) calls "it takes a village to raise a child". To that extend I guess it justifies the OLPC's persistence for "saturation" or at least "large deployments" because it assures to a larger extent the commitment of the other actors in the network. One of the advantages of true networks (as oppose to linear chains) though, is that they still function even if some nodes are missing and eventually collapse above after a certain point of faults. Another characteristic of the networks is that they have major and minor nodes so depending which one is failing the impact is different. I believe that it is important because it may give some guidance to micro-deployments on where should they focus their limited resources ie which "actors" should they first try to get on board. hey mavrothal, you got me there, I have no method of evaluating the relative importance, or fault-tolerance value, of the various nodes. Thank you for addressing the subject in this way. Much of my work relates to communication between UK and Africa, especially Nigeria. I often need to address "reality gaps" regarding assumptions about how things are in Nigeria and about "development" in general. I think the way you are telling the OLPC story will be valuable to me. I'm anticipating that as I read your PhD there will be many points about "development"that are widely applicable, but are hard to explain quickly and convincingly to people who have no relevant special knowledge. If I can introduce these issues through examples from the OLPC story it will be a wonderful jumping off point for discussing patterns that are widely applicable. I've been interested in digital divide issues for many years (in theory and in practice). The divide between top down approaches and practical reality is another element of my work. I'm delighted to find your various references to Tim Unwin's work, as he is one of the few academics whose work relates to the practical realities that I know. It saddens me deeply when I read academic work on ICT and development that is not related to realities on the ground. I believe academic research is too valuable to be wasted on topics that are poorly grounded. My impression so far of your work is that it is a wonderful bridge between academia and practice. Thank you for doing it. Please, if you have any more about these reality gaps, I would love to read it. Hello Lars. I'm on page 57 now - and still much appreciating your thesis. There is so much in it that I'd like to discuss with you. I hope this is a conversation we can have over a considerable period of time. Regarding reality checks - that's a long conversation in itself, and I haven't written much on it specifically yet. If I remember anything I've written I'll point you to it. Most of my reality gap work has been practical. Much of it simply discovering that my own assumptions were wrong, and needing to adjust my thinking and behaviour. In my practical work I've also acted as a "cultural mediator", where there has been collaboration at a distance between UK and Nigeria. Part of my ongoing work relates to building communication channels so that the reality gaps can be recognised and reduced. (I wonder if your work addresses issues around why some people may prefer to keep the gaps wide). If you let me know why you want more about reality gaps I'll see what I can find. Maybe our best approach would simply be to exchange some anecdotes about them here together. I'm on p65 now and still appreciating your thesis. It's so refreshingly holistic and therefore has relevance to my real world experiences. Your work is so different from the kind of research that is confined by narrow academic disciplines and seems to have little relevance outside the world of "academics writing to be reviewed by their peers". I wonder how you were able to escape the trap of narrow disciplines. What academic heading does your work come under? When I first got involved in "development" through my friend the late Peter Adetunji Oyawale I was hungry to learn from the experiences of others (more on Peter - http://dadamac.net/network/peter-adetunji-oyawale ). I didn't want to have to find it all out for myself. I wanted to know what else was happening on the ground, so I turned to the Internet. I read policy documents and research papers. I explored international development, ICT4D, ICT4Ed and related areas. Gradually I gave up, as I came to realise that the academics weren't writing to inform people like me. The academics were writing for each other, and so they were naturally more interested in academic knowledge than practicalities. It was a hard lesson to learn. From 2000 to 2010, I put effort into trying to connect with "the area of academia that overlapped my practice in a mutually beneficial way". I gradually came to the conclusion that it didn't exist. I did find a few voices like Tim Unwin and Mike Gurstein who were pointing out some of the gaps between academia and "my reality". Their voices were describing what I was experiencing (i.e. academic papers that were based on academic interests not on local knowledge or needs). The fact that they needed to say it helped me to better understand the gap. Now I simply "visit academia" now and again as an observer, to see if/how/when our interests may be converging. The main bridges that I cross for my visits are put in place by Tim Unwin's ICT4D group (which is how I came across your work) and through London University - especially CDE (the Centre for Distance Education) which overlaps my interests in education. Your thesis is a new bridge for me. Thank you. do not fluctuate between micro, meso or macro. They extend through relations which intensify at some points while thin out at others"
You give me insights into my world (especially regarding local and global, and micro, meso or macro, and relationships). I struggle to explain where I sit ref local and global. I often cause confusion in conversations by continually jumping between what others label micro and macro. The emphasis of my work continually adapts and emerges in response to relationships and this causes some people to feel I lack focus. However I do have a focus which is guided by the shifting levels of connectedness and "interest overlaps" within my ever-altering network. I put my energy into areas that are currently "energetic and potentially fruitful" (because of what others are bringing). People tend to think that "What they see me doing" is both the "what and why" of what I'm really doing - but it isn't. What I'm doing is what is informing my thinking, and what I'm really doing is thinking and learning - and trying things out in real world situations. I dread the apparently simple question "What do you do?". Even with people who know me well and are interested in what I do there is often the feeling of mistaken focus, the feeling that "What they think I'm doing" is neither the focus, nor the whole picture. Sometimes (perhaps only after a few years have passed) I can construct a temporal narrative that helps other people to make some sense of what I've been doing. It's the truth - but it's only a fraction of the truth - only the obvious and visible elements. It's the tidy, easy to explain, version of the practical work. Alternatively I can share some insights that I've gained, or ideas that I'm exploring (without complicating things by explaining how the ideas came about). You're the first person to have given me an explanation and framework for why I don't have the vocabulary to explain myself to other people. You're also covering so many of the areas (neo-colonialism, Western centric sssumptions etc) that are at the interface of cross-cultural collaboration - the points where reality checks are often needed. No wonder I'm reading your thesis with such delight and recognition. Dear Pamela, thank you again for your kind words, I am very honored, that you are reading and enjoying the thesis! I have tried to write something about reality gaps in chap. 5, but you're right, it is more a practical thing than a theoretical one. And you have a good point about the need for building channels of dialogue across these gaps, between realities (which is much more difficult than simply between interpretations or perspectives :-)! I am not saying that distance is a good form of diplomacy, just that it is very efficient, but I would prefer the type you are talking about, the dialogue which makes visible assumptions and ways to negotiate these.. I never know how to answer the "What do you do?" question either, which is really paradoxical, because after all, I am asking it here :-) Like your's, my practice is a multi-directed tangle, and so is that of the OLPC project I have worked with in NG (and so, I think, are all our practices). If order is made, this is an achievement, not something there already, as you also point out. So what I think we are doing is to throw ourselves into this tangle, which elude all thise clear distinctions of tech, culture, micro, macro, etc, and then, subsequently, some order then "develops". That's what they call a person with mental problems. Lars - I appreciated your reply. I hope to continue reading your work on Sunday, when I have free time. Mephisto - I was interested that you put a response relating to mental health. It echoed a conversation I was having with a friend a few days earlier. We were discussing unusual ways of seeing the world related to creativity, connections, originality, art, humour and madness. Personally, I know that I tend to look at things from an unusual perspective. Being aware of that I regularly question my own sanity. Encouraged by Bo's work I ended my blog on "OLPC, ANT, and breakthroughs for Dadamac and me" on a positive note saying "There was the breakthrough of theoretical scaffolding to help me believe that, even if I struggle to explain what I do, it isn't crazy to be doing it." Lars - thank you for your work, your comments, and especially the final paragraph. I wonder where you interests lie now the PhD is complete. Lars. I'm aware that OLPC news will stop publishing soon. I hope we'll be able to continue this conversation elsewhere.